Canadians do not need to look overseas to witness the impact of violence. 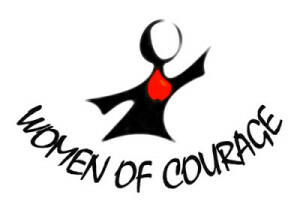 This is why the Women of Courage work links North and South and sees responses to violence in one part of the world as contributing to responses in the other. Throughout Canada, Indigenous women and girls are five times more likely to face violence and disappearance than non-Indigenous women. 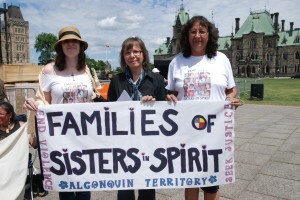 There are more than 600 cases of missing and murdered Indigenous women, and in over 80% of these cases the perpetrators have never been brought to trial despite the continuous work of national and provincial Indigenous women’s groups like the Native Women’s Association of Canada, Families of Sisters in Spirit, Walk 4 Justice, and many more. The work of these groups is often overlooked in places of power and money in our society, yet it is with these groups – and with those who support them- that hope for change lies. 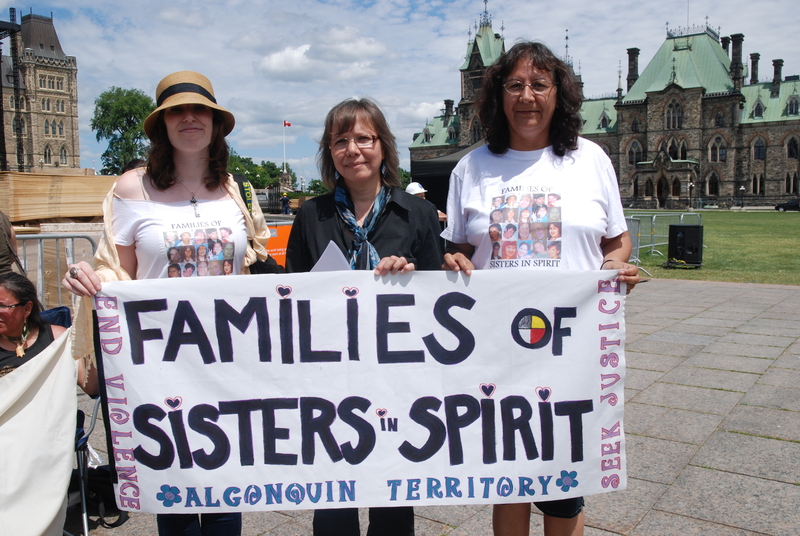 Families of Sisters in Spirit: Kristen Gilchrist, Ellen Gabriel and Bridget Tolley, at Parliament Hill supporting the UN Declaration on the Rights of Indigenous Peoples, June 20, 2011. 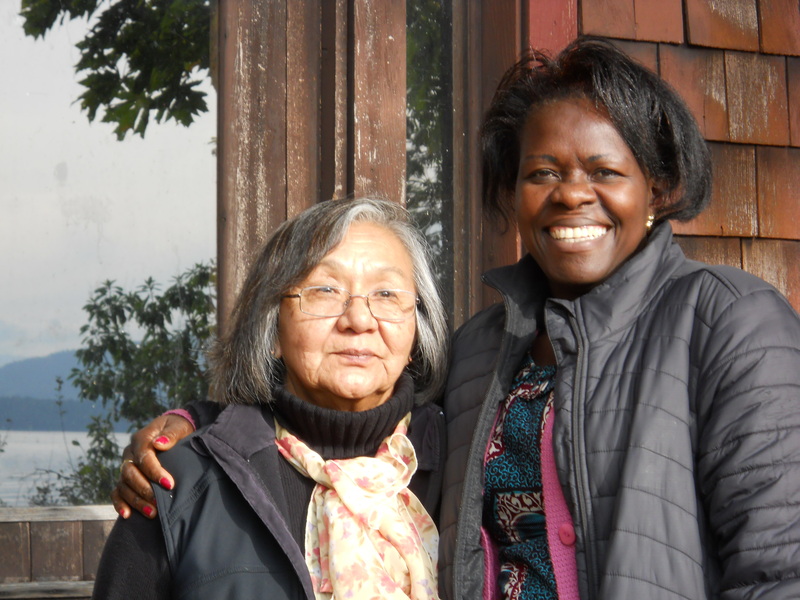 To return to UN Security Council 1325: in case we think this isn’t relevant to us in Canada, let’s remember the struggle to get women on to the agenda at the Missing Women Inquiry in Vancouver. This inquiry was supposed to be an honest look at how the policing and wider societal failures led to the disappearance and murder of dozens of women from the Downtown East Side in Vancouver, the majority of whom were Indigenous. Tragically, it’s become for many people a catastrophic failure with echoes in too many communities across the country. Poor, addicted and marginalised women whose voices we need to hear were cut out of the process. In the context of the inquiry, lawyers were necessary to assist the community in framing its stories in legal terms, but the vast majority of lawyers involved were representing the police, while survivors of violence, families of the victims, and community advocates were denied adequate access to legal aid. In this powerful open letter signed by many groups with whom KAIROS works, you can read the full details of the community’s concerns. We Canadians often tell ourselves that peace-keeping and peace-making are national priorities. How does the reality described in the open letter square with Resolution 1325, and with all the human rights agreements Canada has signed? The Commission closed on June 7 and leaves far more troubling questions than it does answers. The Government of Canada made a commitment to truth-telling and reconciliation in its 2008 official apology to former students of the Indian Residential Schools system – the very system that is at the root of much of the violence that plagues Indigenous communities, and that is displayed toward Indigenous people by Canadian policies and attitudes. Canada endorsed the UN Declaration on the Rights of Indigenous Peoples. We helped write the Universal Declaration on Human Rights. We’ve said much and signed a lot. When do we act, and how? 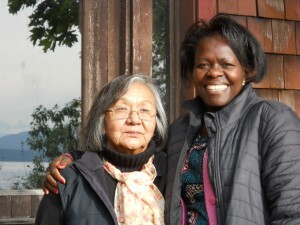 Jill Harris, Penelakut First Nation, residential school survivor and woman of courage, with Congolese women's advocate Chantal Bilulu: On Penelakut Island during the October 2011 Women of Courage visit.